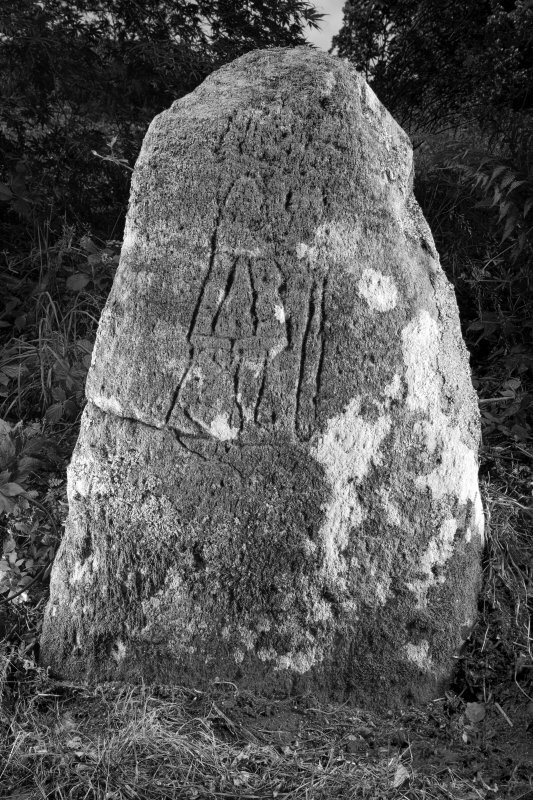 Digital image of sculptured stone from Balblair. 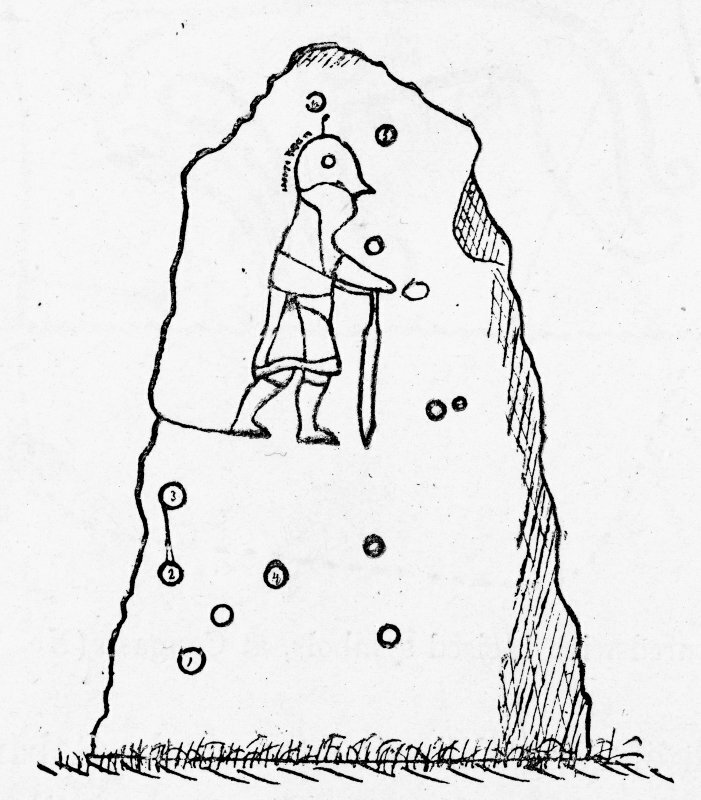 Allen and Anderson, 1903, p.95, fig. 97. Present location: in the rockery in Moniack Castle garden. Evidence for discovery: it was recorded by Stuart as having stood near the old parish school at Kilmorack until about 1827, when it was moved closer to the school. Sometime in the later nineteenth century it was taken to Moniack Castle. 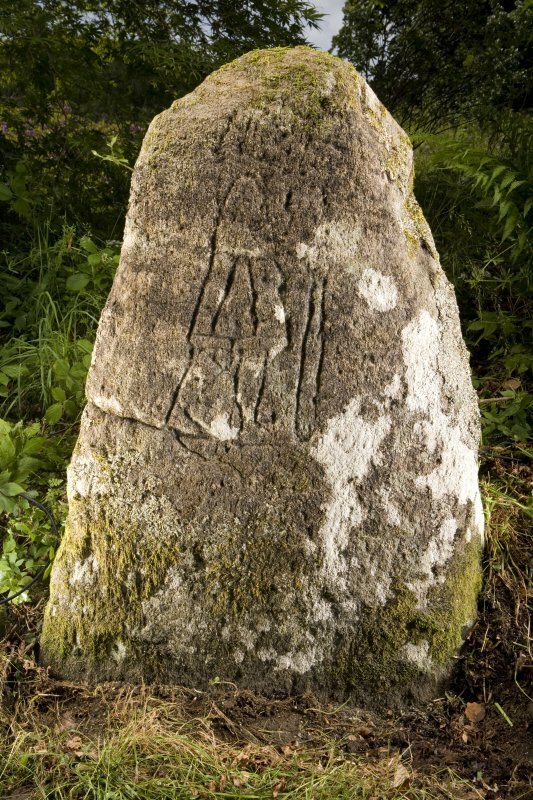 This slab appears originally to have been a prehistoric standing stone with a number of cup-marks carved on it. In Pictish times it was incised with a ‘formidable man’ symbol, seen in profile walking to the right, with a prominent nose and chin. 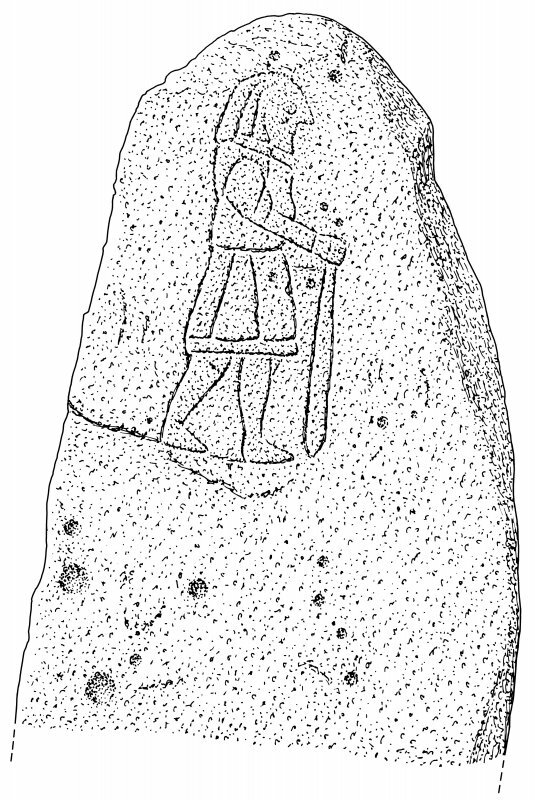 He is wearing a short gored tunic with a band at the hem. Belted at the waist, and he carries a club in his right hand. References: ECMS pt 3, 95-6; Fraser 2008, no 106.1. 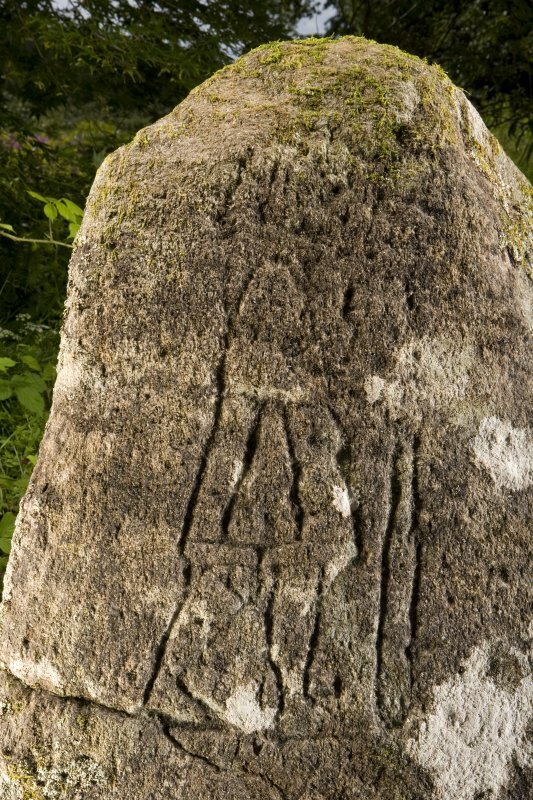 Until c.1827 a sculptured stone bearing the incised figure of a man and fourteen cup-marks, stood approximately 100 yards W of the parish school of Kilmorack. 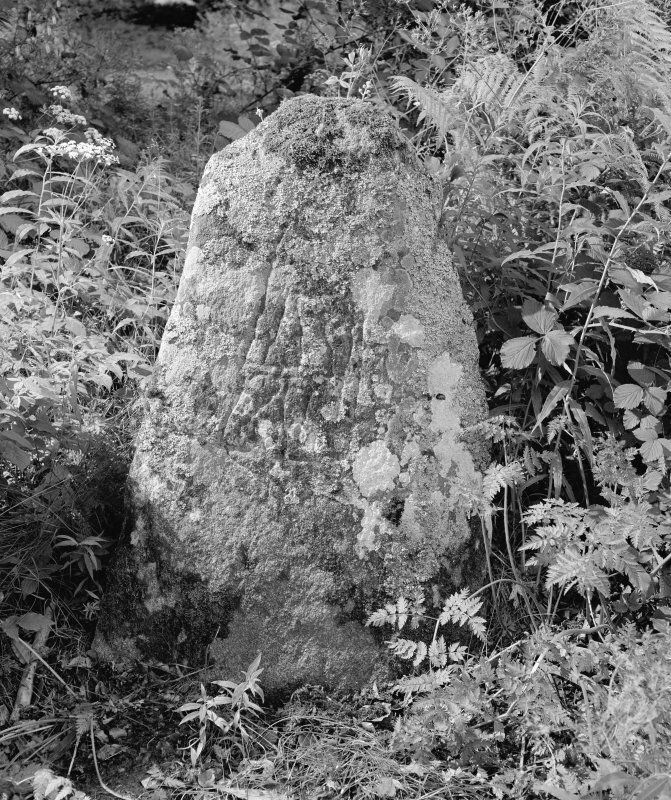 When that area of ground was then taken into cultivation, the stone was moved to stand close by the school, and subsequently, between 1867 and 1903, to the rockery of Moniack Castle, where it now stands (NH54SE 9). The school is depicted on the 1st edition of the OS 6-inch map (Inverness-shire sheet 10, 1876) at NH 51061 45167.